O.: You mean that right wingnut holiday? Is that this weekend? What’s it about? Like, always, but, obviously, this is an attempt to offset the Right side point about Democrats taking over Congress in 2007, and blaming Bush and the GOP. The good news is, Democrats and Republicans agree on the need to solve the problem. And over the last few weeks, the Vice President and I have gotten both parties to identify more than $1 trillion in spending cuts. That’s trillion with a ‘t.’ But after a decade in which Washington ran up the country’s credit card, we’ve got to find more savings to get out of the red. That means looking at every program and tax break in the budget — every single one — to find places to cut waste and save money. It means we’ll have to make tough decisions and scale back worthy programs. And nothing can be off limits, including spending in the tax code, particularly the loopholes that benefit very few individuals and corporations. Face palm. “Spending in the tax code.” That means tax hikes. But, I sort of agree: let’s look at every tax break. How about looking at some of those tax free funds that benefit millionaires? We should look at those, too. Yes, he is going to yammer about this for quite some time, apparently. Much like his slurpee and driving into a ditch points, he seems to love the corporate jet thing. Good thing Obama doesn’t receive all sorts of tax free perks, like a private chef, a country vacations estate, use of jumbo jets, a rent free McMansion, and a $50,000 entertainment budget. Taxpayer funded, and tax free, trips around the world. People in the private sector have to pay tax on the value of private jet trips. I’m not saying Obama should pay a tax on them, he won the job of POTUS, even if he doesn’t act like one, but, it is rather hypocritical of him to complain when he jumps on AF1 to make a quick jaunt to a fundraiser. So good of him to finally mention Independence Day….wait, what was that thing about people determining their own destiny? Freedom and self-governance? How does that jibe with ObamaCare and the individual mandate? And corporate jets? Raising taxes? Hey, wasn’t part of the Declaration of Independence about taxes? 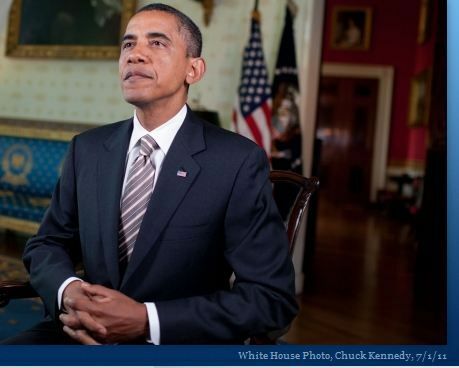 We also have the requisite photo of Obama looking snooty, which comes from the video.